One of the monthly highlights of my mail is the MovieMail Catalogue. I know it's main aim is to sell me things, yet I wish that all marketing literature was so well presented and informative. A certain degree of it's appeal is down to it's niche marketing - international and classic cinema. But there's far more to it. It's well written, works hard to be informative, keeps external ads to a minimum, and complements short capsule reviews with the occasional, longer piece on some of cinema's greatest artists. On top of all that it always brings something to my attention that I wasn't aware of previously. This month, though, they grabbed my attention even more than usual, devoting a whole page to "The Greatest Stories Ever Told - Films for Easter". There are a 15 DVDs/DVD collections on the page, and I hadn't realised that a number of those titles were about to be released in Region 2 format. In particular, last year I bought region 1 copies of David and Bathsheba (my review), and The Story of Ruth (my review) as they were not available over here at that stage. I was also unaware that the Passion of the Christ: Definitive Edition was due to be released over here as the Director's Edition. All three go on sale today. The other thing that caught my eye was The Greatest Stories Ever Told Box Set - an 8 disc set featuring The Song Of Bernadette (1943), The Robe (1953), Demetrius And The Gladiators (1954), The Story Of Ruth (1960), Francis of Assisi (1961), The Greatest Story Ever Told (1965), The Bible (1966) and The Passion Of The Christ* (2004). As this product is also released today, I suspect it's this that has been the driving force behind the article in general. *There does seem to be some confusion as to the films included in the collection. Both MovieMail's in print catalogue, and its website list the films as shown above. Amazon, however, includes The Agony and the Ecstasy instead of The Passion of the Christ. 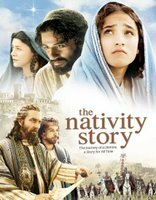 The other films mentioned by the feature have all been available on DVD for sometime - The Gospel According to Saint Matthew, Jesus of Nazareth, The Last Temptation of Christ and Jesus of Montreal. You can subscribe to the free MovieMail Film Catalogue by going through the registration procedure on the MovieMail website. Elsewhere, Peter Chattaway is once again a valuable source of information. We both predicted that despite last week's DVD release of the "extras lite" version of The Nativity Story, a "special edition" would be released fairly soon. So it was not a huge surprise to find out from an article on the Christianity Today Movies website that they are going "to release a two-disc special edition just before Christmas". Anyone interested in that film should definitely read that article. It's something of a post-mortem on why the film failed at the box office. Hardwicke's disappointment is as tangible as the love she so obviously still feels for the project. Peter's other discovery is the release of the 1955 epic The Prodigal. Like Peter, I've never seen this film either. It's never been released on DVD, nor, as far as I'm aware, has it been released in any other format in the UK. All that will change when Warner Home Video release it as part of their Cult Camp Classics 4: Historical Epics collection alongside The Colossus of Rhodes (1961) and Land of the Pharaohs (1955). As Peter notes it's the only film to be produced that is about a parable. There are several films that seek to re-tell a parable without any direct reference to its original source, but this one actually pretends to be telling the story that Jesus was referring to in "The Prodigal Son"/"The Forgiving Father" (Luke 15). It's a highly spurious notion of course. Only the most hard-line literalist would consider that when Jesus begins a story with "There was a man who had two sons" he was recounting an event that actually happened. However, I imagine such a comment is to take the film far more seriously than it actually takes itself. Hi Matt. Do you know whether the prints of "The Prodigal" and "Land of the Pharaohs" are decent letterboxed versions, or dodgy full-screen ones transferred from VHS?